This time, he is back on the big screen to entertain the audience with the help of his upcoming movie Rustom. The latest released video clip looks promising and full of patriotism. But there is always a catch. It’s not entirely seen if he is really a patriot or a traitor or what? Akki started the year, 2016 on an excellent note with his first film of the year Airlift. It was filled with patriotism. Now, in this movie, he will be seen in a navy uniform playing the character role of Commander Rustom Pavri. Akshay shared the good news of releasing the trailer worldwide on the micro-blogging platform Twitter. The film is set in the year 1959 and based in Mumbai. It is adapted from the real sensational case of a naval officer who is brought into the court for killing his wife’s lover named Vikram Makhija. 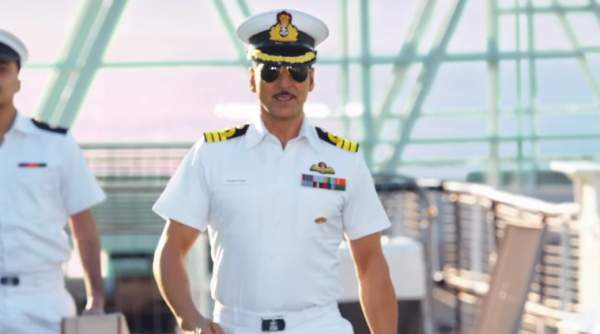 Akshay looks handsome and smart in the naval dress in the film. He has donned the white Indian Navy uniform. The film is tagged with the line “3 shots that shocked the nation” and this tagline is sufficient of creating suspense and thrill for the fans and the cinema goers. The film plot has been made colorful, and it will undoubtedly appeal the masses. Ileana D’Cruz will be seen in the lead female role and portraying Rustom’s love interest in the flick. It also stars Arjan Bajwa and Esha Gupta in supporting roles. The film marks the pair of Akshay and director Neeraj Pandey. Both of them have come together after the much-appreciated movie Baby, which release in 2015. Neeraj is producing the upcoming film this time. The film is being directed by debutant Tinu Suresh Desai. Rustom release date is finalized on August 12 on the occasion of Independence Day 2016. Its trailer will also be tagged with Salman Khan’s upcoming movie Sultan on July 6. Did you enjoy watching Rustom official trailer?